The Goon Squad is one of the oldest traditions on the Syracuse campus. Since 1944, Goons have been one of the first faces new students see on campus. They welcome first-year and transfer students and their families by helping with move-in. When does the Goon Squad help with move-in? Move in early on Monday, August 19! Student orgs with 4 or more members volunteering as Goons can have a table at the Orange Blast Org Fair for FREE! It’s a great way to recruit more members! The student organization with the most individual members volunteer will WIN a catered pizza party for up to 50 members! The individual students who volunteer multiple times will be entered into a raffle to win FREE coffee or lunch at Goldstein Alumni and Faculty Center, a Spirit Pack from the Bookstore, and more! The more shifts you attend, the more entries you’ll have! Be part of a long-standing tradition at Syracuse and help new student move in! Attend a mandatory training session on Monday, August 19 at 7 p.m.
As spring semester comes to an end, there’s one last event we are all looking forward to and that’s Mayfest! We all want to have a good time and go out with a bang but what if I told you, you can have a blast at Mayfest all while being safe and keeping these tips in your back pocket! 1. Eat a high protein meal. Before the festivities begin make sure you eat! You do not want to skip any meals or go hungry so a nice meal with lots of protein can slow down absorption of alcohol if you do choose to consume it. Keep in mind there will also be free food at Mayfest! So stand in line for one of the food trucks and tents, and grab something protein rich. With the warm weather approaching and all the outdoor activities occurring, make sure to stay hydrated. Also, alcohol strips water from the body, so keeping hydrated is the key to prevent dehydration and potentially lessen the likelihood of a hangover! 3. Make sure you know your limits. If you choose to consume alcohol, make sure you know your standard drink sizes. Know how much you can and cannot consume! Most importantly remember that tolerance doesn’t affect your BAC (blood alcohol content) levels and consuming at a higher rate will still affect you so if you do choose to drink, drink responsibly! That can look like spacing out drinks over time or setting a limit for the day prior to engaging in the festivities. 4. Participate in activities that are unrelated to alcohol or other substance use. With Mayfest and the warm weather, we all tend to get super excited. Make sure not to dedicate all games to alcohol or other substances as it can get super risky and dangerous. You can do so by limiting drinking games, taking breaks, or playing games that do not involve substances at all. There’s plenty to do at Mayfest that doesn’t involve drinking. Be sure to listen to this years’ amazing artists, dance at the silent disco, have fun in the ball pit and take a ride on the carousel! 5. Plan for a sober way home. If you and your friends choose to consume alcohol, make sure you all have a sober way to get home! There are many options such as Lyft, Uber, ShuttleUHome, campus buses and shuttles and much more that will get you home safely! If you decide to use a ride sharing company, make sure you check the license plate and make the driver say your name prior to getting in. Traveling with a friend can also help you stay safe. 6. Make sure your phone is charged and have emergency numbers programmed. If you plan on participating during Mayfest, we all know it can be an all-day affair so charge your phone the night before to prevent your phone from dying during the middle of the festivities. Also make sure that you have emergency numbers in your contact list such as 911, 315.443.2224 (DPS), 711 (DPS from a SU campus phone), #78 (DPS on cellphones), 315.443.4299 (SU Ambulance.) Having these numbers already programmed in your phone will keep you prepared and safe if you find yourself or someone else in a serious situation. Follow these party smart tips to help ensure you a fun and safe Mayfest! Make sure to take advantage of the warm weather and celebrate the end of the semester but most importantly BeWise! 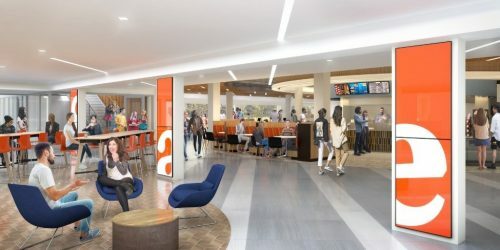 In case you missed it, Schine Student Center will undergo a major transformation. If you’ve paid attention to Pete Sala’s emails, you know that construction is scheduled to start in May after the semester ends. The new design includes enhanced accessibility, more space dedicated to students (we’re talking THOUSANDS of square footage), and more connectivity across the levels. Here are some of the illustrative renderings to get an idea of the design concepts! 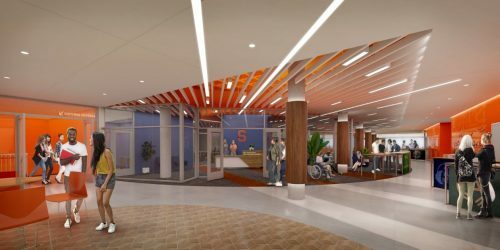 With a new façade and opened central atrium on the second floor, Schine Student Center’s new design will let the sun shine in, making it brighter and more open. 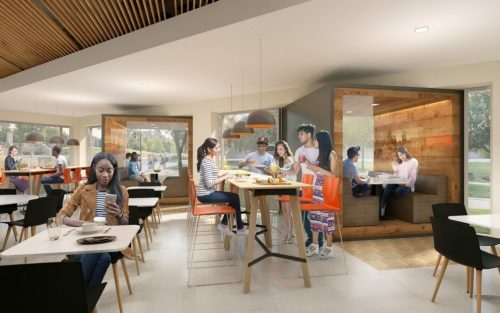 We know food is important, and with the enhanced layout and seating in Schine Dining, there are going to be WAY more options for eating and hanging out. 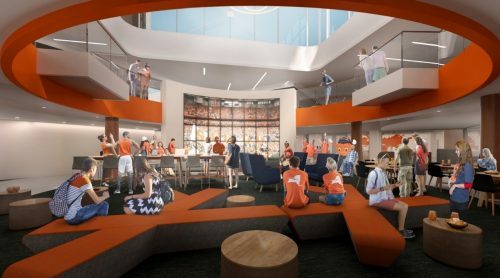 Student organization space will be moving to the second floor of the building (Einhorn Family Walk level) with the offices of Student Activities and Fraternity and Sorority Affairs, putting student involvement front-and-center and right next to tabling space, too! 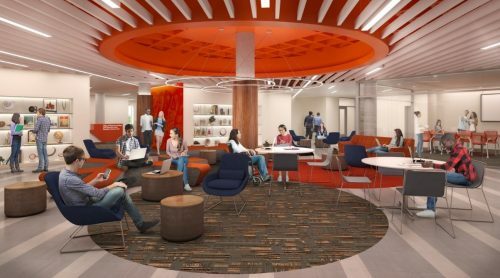 The Disability Cultural Center, LGBT Resource Center and Office of Multicultural Affairs will co-locate into a new hub, featuring a dedicated lounge space in front of the entranceway. This new hub will promote inclusion, intersectionality and collaboration! On the first floor lounge, a massive media wall provides a new place to watch games or a livestream of the latest event. This first floor atrium will have plenty of versatile seating for hanging out, studying or eating. Curious where stuff will be during the renovation? Make sure you check out the temporary relocations for offices and dining options! And don’t forget, the Bookstore and Goldstein Auditorium will remain open during the renovation! Interested in tools that will help you budget and curb your spending habits? Check out these budgeting app reviews from the Office of Financial Literacy’s Smart Money Coaches! The app is available for free in the app store. It requires you to connect your bank account so your spending habits can be tracked and analyzed over a period of time. Mint is able to provide you suggestions about where your money is predominately going and how you can better utilize your cash to increase your savings and investing accounts, if you have them. One important thing to remember is Mint will not access any of your funds or touch your money. The app itself serves as more of a data gathering tool to help you make informed decisions. My favorite part of using Mint was the different budgets the app provided for me to curb my spending. For example, every month I can spend $720 on restaurants, $30 on gas, $200 on groceries, etc. The way the budgets are segmented is really easy to follow, and Mint will send you reminders when you are tapped out in any of the categories. This is helpful because sometimes we are unaware of how much money we are really spending and it’s difficult to confront your spending habits. One thing I didn’t like about the app is the categories are pre-set for you so you cannot create your own budgets. This can be difficult because budgets are often not a “one size fits all” solution; they must be individualized based on people’s needs. For example, someone who lives in a city will spend a lot of money on transportation services like Uber and trains, whereas living in the suburbs comes with more money going to gas. I drive quite often so the $30 a month gas budget was limiting for me and I went over each time. Some room for improvement for Mint would be to give people the ability to set their own budgets so that there’s a higher percentage they will follow it. Another thing I didn’t like was the constant notifications I received about decreasing my spending in categories I wasn’t too worried about, such as “coffee.” I was more interested in tracking groceries, restaurants, educational expenses, and shopping habits. Of course, you can turn off the notifications in the app so that’s a plus. All in all, I would recommend Mint for someone who’s interested in learning how to budget and analyze their spending habits. The app is a good resource and makes your job easy because they gather the information for you through your bank accounts. In the long-term, it is interesting to see how your financial habits develop and the awareness aspect helps drive accountability. I would rate the app a 7/10 and I recommend everyone to download it and see for yourself! After four weeks of review, the results are in – for Mint of course! You have probably seen commercials promoting Intuit’s free personal finance and budgeting application, Mint, that offers a variety of functions for financial planning, budgeting, and tracking your money. I tracked my own spending habits, budgeting, and income over the past few weeks with Mint and I am here to tell you what I thought. Was Mint worth the hype? Some of my favorite functions include pre-programmed budgets based on your cash flow, where you spend the most, a pie chart of your monthly spending by category (which one is the biggest? ), and your cash flow summary. After entering the information for your bank accounts, the app automatically generates these functions for you, sending you notifications when you begin to spend more than you have made and if you are spending more than usual on one category for a given month. Another available function is the programming of bills and due dates. This is especially helpful when it hits that time of the month when due dates overlap. Instead, Mint provides a centralized location for all your funds and activity. Though my experience with the app was positive, and a majority of its features were comprehensive and easy to use, the app was extremely robust. Sometimes, it felt like there were too many functions, and I was not able to make use of all the tools the application had to offer. Additionally, although the credit score function was extremely useful, if you do not have a major, name brand credit card (for example, you have a credit card through your local banking institution), it may be difficult to program the credit card function of the app. In my case, my credit card is distributed through my local bank, and I was not able to load my credit card account to initiate reminders about payment, my balance, and my credit usage for the month. So, to answer my question, was Mint worth the hype? My honest answer: it depends on how much time you are willing to put into it. If you are just looking for a place to track your income and spending habits without the extras, I would suggest a more straightforward app. But, if you are interested in more analytical, in depth functions that break down your personal finances in an understandable manner, Mint may be for you! Check it out! For the past three weeks, I’ve used the budgeting app You Need a Budget (YNAB) and have come up with my opinions about why I like/dislike the app, and whether or not I would recommend it. To start off, the app requires a monthly subscription of $6.99 or a yearly subscription of $83.99. While you are granted a month-long free trial, it is still a bit costly, especially for college students who don’t need to add an additional expense. When it comes to navigating the app, it appears to be a bit simpler than it really is. Although it’s easy to view, it still has its minor flaws that contribute to its overall effectiveness. For my personal experience, the numbers in my bank account on YNAB didn’t accurately align with my actual total in my personal bank statement. The app also doesn’t give you notifications when you make a purchase, so you have to remember to manually go in and sort your spending/assign a budgeting group, which I know for me is something I forget to do when not constantly reminded. The last issue I had with the app was that it gives you multiple categories to sort your outgoing and incoming costs, but the options are limited. So, many of my categories for the budget didn’t as accurately reflect what I was actually spending. Overall I would give YNAB a C rating because even though it is costly and has a few minor flaws, it is still relatively easy to manage and helpful to see where your money is going. As an international student living in a foreign country by myself, I try to be as financially responsible as possible. That is why I am reviewing the budget app, You Need a Budget (YNAB.) The number one thing YNAB helped me realized is that we should distribute all our dollars properly. 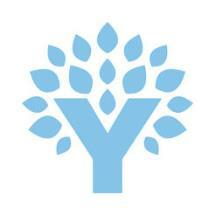 On the YNAB app, you can allocate your money to different categories, such as groceries, insurance and transportation. This way, it is easier for you to see how much you spend or will be spending on different items per month. You can even plan ahead for the next month. For a plan freak like me, this feature is perfect. The YNAB app also enabled me to live on last month’s budget. This is extremely important if you have several saving accounts. For me, I have three saving accounts, and they are all for different purposes. It gets complicated to keep track of how much I should plan for next month. The YNAB app shows you the budget distribution for several months, it also provides graphs and statistics. This app is quite expensive to subscribe. It is about $84 per year. If you are a student who has several bank accounts for personal purposes, this might not be the app for you. However, if you are managing or thinking about starting a small business, this app is perfect. Connecting Accounts –Financial budgeting apps work by pulling data from your bank, credit card issuer, brokerage account, etc., so the process of connecting accounts should be easy and simple. PocketGuard lets you add apps easily through their platform and only required that I provide my login credentials. Account Diversity – PocketGuard has many banks on its platform, and it even had some more obscure banks and credit card issuers. Bill Tracking –Adding recurring bills was easy, because it looked through transactions history and pulled out the ones it thought were recurring; it just double checked before adding something. Security – Even after unlocking my phone, PocketGuard would not let me into the app without reentering the unique pin number I set when I first used the app. Unique Features –I really like the overview feature; PocketGuard has a great feature that lets you look for ways to increase your income and save money; in fact, PocketGuard has resources to learn about real estate investing, saving money on car payments, and earning more interest with different savings accounts. Account Diversity – Unfortunately, PocketGuard does not currently have Robinhood Investments, a popular millennial-focused stock broker. Security – I would really like to see a fingerprint feature added in the future, especially because other apps have already implemented that seamlessly. I like PocketGuard, and the features it has are remarkably close to the main apps in the field –Mint, YNAB, etc. Although it still needs to add some investment functionality, I enjoyed using the app and would recommend it as a unique alternative. Budgeting apps are a great way to stay on top of your personal finances. Whether you are looking for an app that simply helps you track your spending, or an app that creates personalized budgets, there is an app out there for you! Take the plunge and move one step closer to managing your money! It’s that time of the semester. Classes are winding down, final exams and projects are picking up, and the snow is (hopefully) behind us! According to our calculations, that means Mayfest is right around the corner! Mayfest 2019 is Friday, April 26, from 1 to 6 p.m. at Walnut Park. If you’ve never been to Mayfest, you should know that it’s a Syracuse University tradition for everyone to come together and celebrate the end of the spring semester. That means a free (for SU and ESF undergrads) day of food, fun activities and a serious line up of talented musical artists. If you’re a Mayfest pro, you know that University Union (UU) keeps all the best parts year-after-year, but still keeps it fresh. AND, whether you are a first-timer or seasoned pro, it’s always important to be a safe, respectful community member (be sure to review this message from Mayor Ben Walsh and be mindful of the city ordinances and Code of Student Conduct). UU did it again! This year’s Mayfest line up is exciting, eclectic and sure to be a hit. Taking the 2019 stage is rapper Saba, electronic artist Whethan, and Adult Mom. Need to know more about your 2019 artists? Check out the UU blog for the deets. Let’s be honest, if you didn’t get a corn dog, did you even go to Mayfest? Not into corn dogs? There’s loads of free food to choose from. We’re talking burgers, hot dogs, chicken tornadoes, and all the orange soda you can drink. There’s more than just orange soda, but you get the idea. And don’t worry, there’s plenty of vegetarian and halal options, too! Even though there is plenty to do at Mayfest for people who choose not to drink and/or are under 21, there is a designated section for students and their guests who are of legal drinking age. If you’re 21 or over and chose to drink, there are bracelets available for $3 that include three tabs redeemable for a total of three beverages. This years beverage choices include beer, gluten free beer, hard cider and wine slushies. If you’re 21 or over but choose not to drink and still want to hang with your friends in the designated beverage area, you’re more than welcome to. New this year, students of legal drinking age can opt to have a free non-beverage bracelet that grants them access into the designated beverage area. If you’re looking for either bracelet option, please note that you CANNOT obtain a bracelet at the park during the event. All bracelets must be obtained in 304ABC Schine Student Center prior to gaining access to the park. You can get a bracelet Wednesday, April 24 and Thursday, April 25, from 11 a.m. to 7 p.m. or Friday, April 26, from 9 a.m. to 4:30 p.m. Plan ahead and get your bracelet early! For more info on beverage and non beverage bracelets, be sure to read the Mayfest 2019 Need-to-Knows or check the SU Mayfest website. We’ll see you Friday, April 26 in Walnut Park for Mayfest 2019! Remember to be safe and have fun! If you have any questions, visit University Union’s website and the SU Mayfest website for all the information you might need. There’s a lot of things you might want know that aren’t covered in this post like guest ticket information, day-of-rules and parking. Make sure you know the rules and are prepared! Being prepared makes the day so much better for you, your classmates and the awesome people that make Mayfest happen. While students at Syracuse University love giving their 110 percent all the time, that can be easier said than done. Stress is often not a fun thing to talk about or manage, but if you know the right resources and coping mechanisms, it can be a lot easier than you think. Stress comes in different forms. Finals. Internships. Friends. Jobs. Family. Budgeting. Grades. With over 300 extracurriculars students can participate in, 120 credit hours to graduate, and time for friends and a social life, students at SU love to be busy. But, it isn’t always easy. The National Alliance on Mental Illness reported that 40 percent of college students have felt more than an average amount of stress in the last year. For SU, that is an average of 8,994 students. In April, SU and the Office of Health Promotion (OHP) host Stress Less events throughout campus to teach more students about stress and how to manage and cope with it. Stress is our body’s response to a perceived demand or threat. Everyone experiences stress differently, so before you can manage stress, it is important to identify some signs that you may feel stress. There are physical signs and effects of stress, such as feeling sick or having headaches or difficulty breathing. There are also behavioral signs and effects that include changing eating and sleeping patterns, procrastination and increased substance use. Issues with memory concentration, poor judgement, and worry or anxiety are often mental signs and effects. Lastly, emotional signs and effects include depression or anxiety, increased moodiness or anger and feeling lonely or overwhelmed. It is important to note that everyone experiences stress differently, so while you may experience physical signs and effects, your best friend may feel some of the more emotional signs and effects. While stress is often viewed as a negative feeling, it can actually sometimes be positive: this is distress versus eustress. Distress creates negative feelings, causes negative consequences, and can often involve procrastination. Eustress, on the other hand, can actually compel us to act, enhance our cognitive abilities, and can make us more productive. Think about how a runner feels right before the shot goes off for the race. While they are most likely feeling anxious, nervous, and tense, they need this stress to motivate them to run as fast as possible. So that’s stress. You know how to identify it and what it means. Not to fret, there are plenty of ways to cope with stress. Once you recognize when you feel stressed, ask yourself why – what specifically is making you stressed? You can become aware of these stressors and then recognize what you can change, either in that moment or in the future. Just as everyone experiences stress in different ways, everyone manages stress in different ways. Sleep 7-9 hours a night, exercise 3 hours before you sleep, and eat a healthy balanced diet. Try relaxation techniques like meditation or breathing routines. Prioritize and manage your time. If you have an exam tomorrow but also need to clean your room, your messy room can wait! Prioritize your exam, so you don’t get too overwhelmed later. Try not to drink more than one caffeinated beverage a day. Reach out if you are feeling too stressed, and visit OHP for resources. Also, know that you are not alone. SU has plenty of resources to try and help you feel more comfortable and at home. MindSpa: The MindSpa is currently located in the basement of the Counseling Center (111 Waverly Avenue) and offers all the de-stressing methods one needs: guided meditation videos, comfy cushions, a Happy Light, de-stress trinkets and more (just schedule a time online). Pacifica: Any SU student can download the Pacifica app for free with their NetID username and password. This app offers daily mindfulness tools and techniques. 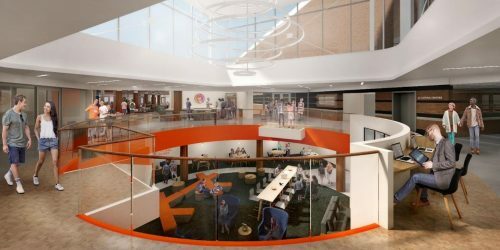 Health Hub: Have you ever seen a bright orange dome appear in your school building? The Health Hub pops up all over campus 2-3 times a week and promotes different health and wellness initiatives. Spin the wheel, learn something interesting, and get a prize (10 swipes and you get a free water bottle)! SoulTalk: This student-run discussion meets once a week to explore your greater purpose and to understand and explore different parts of yourself. Therapy Dog Thursday: This one is an SU favorite. Every last Thursday of the month, stop by Bird Library to pet some adorable therapy dogs. This week, OHP is offering Stress Less events. These events will be in Bird Library on Wednesday, April 24 and Thursday, April 25, from 3 to 5 p.m. While stress is different for everyone, SU students should know that they are never alone. The Office of Health Promotion, Health Services, Counseling Center, and Student Assistance are four offices that are completely meant to help students. If at any time you or a friend feels like you might need help, please reach out to any of these resources. If you are currently experiencing a mental health crisis or seeking support regarding sexual assault or relationship violence, 24-hour 365-days-a-year crisis support services are available to all SU students by calling 315.443.4715. In-person services are available during regular business hours, Monday through Friday, 8:30 a.m. to 5 p.m.
Eat less meat. Meat production accounts for 20% of greenhouse gas emissions every year, more than the emissions of ships, planes, cars and all types of transport combined. If everyone went meatless one day a week, it would make a huge impact on the environment. Try out Meatless Monday on campus! Keep a recycling bin in your room. Most people I’ve seen don’t keep one, but it’s not that difficult to sort your trash if you have a separate bin for all your paper and recyclable items! Every dorm has a trash room with a designated recycling area, so keeping everything sorted is a best practice. It’s a good idea even if you live off campus, too! Invest in a reusable water bottle. Reusable water bottles are ultimately cheaper than buying a new bottle of water everyday, and as a plus brands like Swell and Hydroflask are making them super cute! Be sure to refill your water bottle at the filling stations across campus. Don’t throw away old items. Things like clothes, towels and other textiles can usually be donated instead of being thrown away, and someone else will get to enjoy them! Another fun idea is to have a clothing swap with friends where you trade all of the old clothes you don’t want or use anymore. Keep reusable dishes and silverware in your dorm and/or backpack. It’s ultimately cheaper than buying plastic ones and way less waste. Bring your own cup to your favorite coffee shop. Many people don’t know that People’s Place, Starbucks and SU Food Services will actually put your drink in whatever reusable cup you bring! As an added bonus, some spots usually make the drink bigger. Stop using plastic bags at the grocery store. Coming from California, I was shocked at how many plastic bags grocery stores here in Syracuse use. Bring reusable tote bags to drastically cut back on plastic use. Join a student group supporting sustainability! There are multiple student groups and clubs open to all Syracuse and ESF students looking to make a difference surrounding campus sustainability efforts! Each one focuses on different aspects of sustainability, so you’re sure to find the right fit. For more tips on how you can be more green, visit the Sustainability Management website. You should know by now that Schine is getting a makeover. We’re talking enhanced accessibility, upgraded dining, more student spaces and a bigger, open central atrium with more lounge space. Basically, anything you might want for a more student-focused space. Exciting stuff! 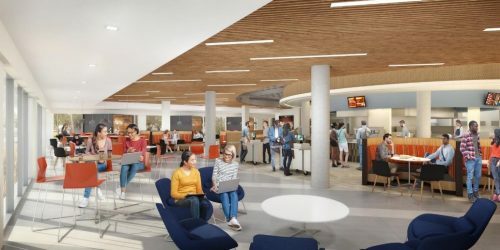 With all these great improvements coming, there are a few changes that you should know about; changes like offices moving, Schine dining temporarily closing (and adding options in other places) and entrances shifting. We’ve outlined the important stuff for you, so make sure you’re in the know! Schine Box Office will relocate to Suite 118/119 in the Women’s Building. The Shaw Center for Public and Community Service along with the Office of First-Year and Transfer Programs will relocate to Suite 309/310 in the Women’s Building. Career Services will relocate to Suite 214 in the Women’s Building. The Office of Student Activities and the Office of Fraternity and Sorority Affairs are moving to Suite 100 in the Women’s Building. Learning Communities and Student Centers and Programming Services (SCPS) will relocate to Suite 138 in the Women’s Building. Food Services will enhance staffing and add popular menu items to Pages Cafe and food.com. Starting in the fall, Kimmel will open earlier to help fill your breakfast and lunch needs. The Bookstore and Goldstein Auditorium will remain open. That’s a lot to remember all at once. So to make it easy: the Bookstore and Goldstein Auditorium will still be open; OMA and DCC are moving to Bird; Everyone else is moving to the Women’s Building. Great question. The entrance from the Einhorn Family Walk and the entrance between the Bookstore and the auditorium (East entry) will be open. Both are accessible with the East entry accessible path starting on Waverly Avenue. The Einhorn Family Walk will serve the bookstore. The East entry will serve Goldstein Auditorium. Have questions? Stay tuned for upcoming tabling dates where you’ll be able to ask and get more info. As renovations start and progress is made, be sure to follow The Peel, SU News and Pete Sala’s emails for updates! So you’ve done the hard part. 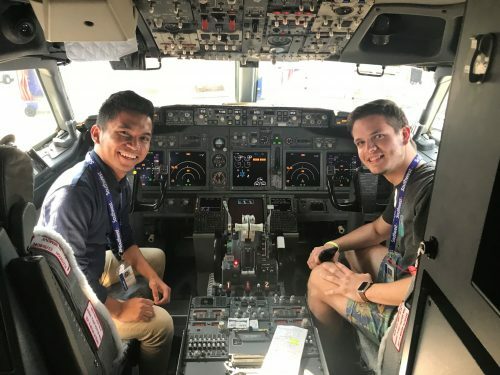 After countless emails that started with “Thank you for applying but we’ve decided to move on with other candidates,” you finally received the news you’ve been waiting for: an internship offer. Now what? When in doubt, reach out! 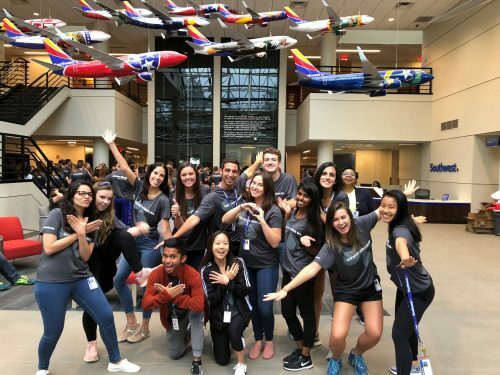 Don’t forget that internships are opportunities for you to learn, so don’t feel like you’re bothering your manager or your team if you ask questions. Just remember to ask insightful and meaningful ones, so do your research first. Your manager or someone from your team usually becomes your mentor but push yourself to reach out to other teams or departments. Reach out to your HR manager and tell them about your other interests and they can connect you to the right people to connect with which may lead to more mentorships. Ask about opportunities to grab lunch or a quick coffee chat! Your resume is a living and breathing representation of your personal and professional accomplishments. Throughout your internship, you’re likely to work on big projects that create a meaningful impact. Remember to consistently jot down your role in the project and highlight key accomplishments including key metrics. Chances are, you’ll spend a good amount of your day reading and responding to emails. Remember to be professional and make sure your emails are grammatically correct and free of typos. A good practice is to have a fellow intern proofread it, especially important ones! Whether it’s through email, LinkedIn, text or even social media (as long as you keep it professional! ), staying in touch with your manager and team is crucial. They will become your most valuable resources in terms of finding possible future full-time opportunities at the company or even elsewhere. In a blink of an eye, your internship will go by quickly. It’s important to make the most of out it by making sure you take this chance to learn as much as possible, build meaningful connections and develop yourself personally and professionally. With only 40 days and counting, graduation is quickly approaching for us seniors. For most, this departure from ‘Cuse is bittersweet, but end on a high note and make the most of your last few weeks. I’ve gathered 15 activities that every senior should do before they cross that stage on May 11. P.S. Many of these activities are listed on the ’Cuse Challenge app, so download it to remember which tasks are on your must-do list and even get points for taking photos doing these challenges, which you can redeem for prizes! If you have made it this far in your Orange journey without going to Mayfest, wait no longer. This annual tradition is the best way to wrap up senior year before the finals scaries creep up on you. With your SUID, you can see a free concert, get free food and do fun activities in preparation for the Block Party concert later that day. The University is just one part of ’Cuse. Downtown Syracuse has so much more to offer. Whether it’s pasta at Pastabilities, brunch at Funk N’ Waffles or tea and board games at Roji Tea Lounge, there’s something for everyone. As always, the Connective Corridor bus is free with your SUID and takes you right downtown. You are never too old to attend an Orange After Dark event. With upcoming programs like Trivia Night and Grocery Bingo, there is no excuse to stay in. OAD also offers free screenings of recently released movies all year long on Friday and Saturday at 11 p.m. in Gifford Auditorium, check out the full Late Night Movie schedule. Whether it’s giving blood at an American Red Cross drive, donating non-perishable food to the Hendricks Chapel food pantry or contributing $20.19 as a Class Act donation, give back to the college that has shaped your last four years. It may seem a little cheesy, but the Dome Stomp is an almost essential experience to do as an Orange. All you have to do is jump really hard in between the columns on the outside of the Dome, and listen to the weird, indescribable sound that it makes after. There are so many amazing statues that you may not even realize exist on your daily commute to class. Take the time to observe all the statues on campus like Abraham Lincoln, Diana the Huntress or Ernie Davis because it’s a fascinating look into the University’s history. Make the trip up to Higher Onondaga Park for a picturesque, quiet view of Syracuse with the day’s sunset as the backdrop. It is only a 10-minute drive from campus, but it will be worth every Instagramable moment. Skaneateles is a small town 40 minutes from here that is known for its cute shops and tasty eateries, as well as its beautiful view of the nearby lake. This would be a great day trip to experience a change of pace and take a walk on the pier. If the hills on main campus don’t bother you, consider taking a hike in one of the many hiking trails throughout Central New York, which is jam-packed with breathtaking views. As the worst of Syracuse winters is behind us, this is the perfect time to get a group of friends off-campus and explore the beauty surrounding this city. We have all probably visited the mall for our miscellaneous shopping needs, but Destiny has so much more to offer. It’s a one-stop-shop for an assortment of adventures like bowling, a ropes course, race-car driving, a Regal Cinema, an escape room and more! Don’t forget to pick up $10 movie passes from the Schine Box Office to save money at the theaters. Trivia Night at the Inn Complete – Every Thursday, 9 p.m.
Syracuse is a melting pot of different cultures and cuisines. Step outside of your Chipotle and Varsity comfort zones and taste all of what local restaurants have to offer. Get some friends, create a list of restaurants in the area that you all want to try out and coordinate good dates to go. Pro tip: make sure to wear your stretchy pants. Support local actors and go see a play at Syracuse Stage. The current and upcoming shows are Pride and Prejudice and The Humans. To round out the experience, Syracuse Stage also offers prologues and dinners that accompany the show but note that those tickets are separate. This should go without saying, but if you don’t have a photo with Otto the Orange, did you really go to Syracuse? You can always find Otto scooting around at campus events, but having a great Otto flick in your back pocket is priceless. The University Lecture series brings distinguished guests from various fields to Syracuse University to talk about their respective career. Just this year, this series has brought guests such as Trevor Noah and Margaret Atwood, with the next speaker being Martin S. Indyk. These are an amazing, free opportunity to learn from some of the greatest minds in the world. Good luck checking off your bucket list! Written by Nadia Suleman ’19, S.I. Newhouse School of Public Communications.